Here’s a selection of local sources to pick up fresh farm produce so you can savor seasonal veggies from local farmers and also support them. I love going to them and wish I lived closer to one so I can go everyday. Wow, amazing how many new fresh farmers’ markets have sprouted since I last posted this! 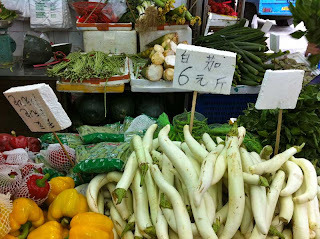 In Asia, there are farmer’s markets everyday and people like to shop right before they go home to prepare their meal. There is a LOT of choice and everything is so fresh and gorgeous smelling, it is intoxicating and a feast for your eyes and nose. 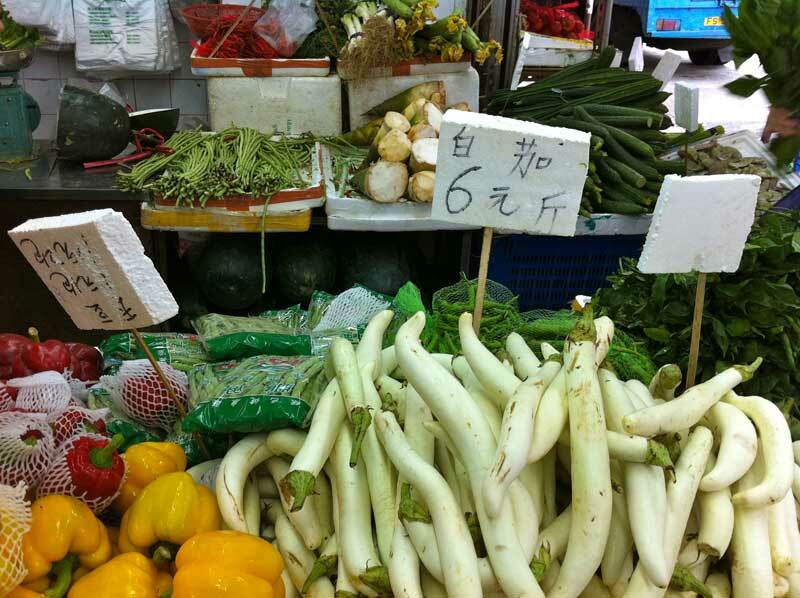 Here’s my post, Hong Kong Market where you’ll see fish so fresh, they’re still swimming. Mark Bittman, The Minimalist, New York Times columnist wrote a great article about “Eating Food that’s Better for You, Organic or Not” that reflects so much of the same philosophy I have – “that the organic question is a secondary one” when we don’t eat enough vegetables in the first place! Well, now you have wonderful fresh vegetables, I hope you’ll try my simple, easy and delicious stir fry with an Asian twist. Punch in your zip code for Community Supported Agriculture farms that sell subscriptions to receive regular delivery of seasonal crops. HOH WOK CLUB: I put this club together to celebrate and explore new foods, friends and exchange ideas. When I find a good Asian influenced restaurant, I organize a special tasting menu with the chef so we can get a flavor of what they offer. Subscribe to my newsletter (wokstar at eleanorhoh dot com) for updates of these gatherings and all things Asian and beyond. Cobaya Miami is an “underground supper club” started by 3 foodies so South Florida chefs can experiment on human guinea pigs! I’ve been one, it was fun to meet new folks but way too much food in one session, here’s my post. You have to be a member to participate, sign up on their site. South Florida Foodies: This is a closed group, you have to request to join but what a fun group of foodies! They organize gatherings at the latest, trendiest, yummiest restaurants. An upcoming gathering is an ‘Avant Garde Pot Luck’ in a private penthouse apartment for just 30 and I got in! South Florida Food Swap: I made kimchi to swap with Marie’s (founder) aji (Colombian chili sauce) but didn’t quite make it to the swap cause I was on my way to Hong Kong. You can find out how it all works as well as upcoming swaps in your area! Miami Culinary Institute is a fantastic, brand new, state of the art facility in downtown Miami. They not only have a cooking school for those who want to be professional chefs but also have classes for ‘food enthusiasts’ which include wine appreciation and many innovative topics. I got the grand tour at their opening and they’ve done a beautiful job. They also have their own food truck, Alphabite! I give them a mention here. They recently added an organic edible garden. Bee Heaven Farm: organic farm started in 1955. 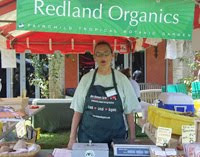 They now offer CSA program through Redland Organics. 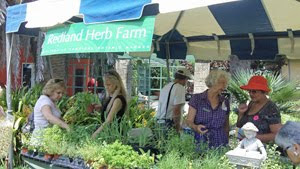 They can be found at Gardner’s Market, Pinecrest Sundays from Jan. to April. 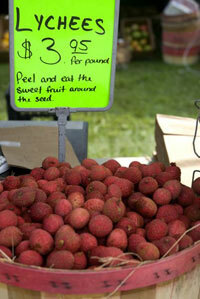 Coconut Grove Organic market: They have prepared dishes and desserts, not cheap but good. Go early so it’s fresh and the vegetables don’t get wilty. I believe my favorite bread, mango and date from Key West is available there. Be prepared to wreck your diet because once you start the loaf, you cannot stop. I just met them at the Food & Beverage show (10.26.2010) with their beautiful display of fruits and vegetables. They were bursting with color and so fresh I asked if they were ‘real’!! They insisted I try the famous “Electric” flower called Szechuan Button, grown in Africa and China! Makes your mouth and lips tingle, very weird. CALL before you go, they cater to restaurants, so EARLY shopping hours! 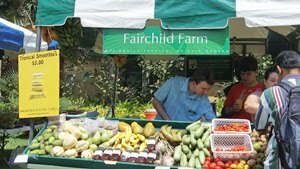 Farmfreshmiami.com is a new site for organic fresh produce. Sounds like Erika is doing a great job of getting into different locations. We talked about cooking classes to use her produce. Green South Miami, Farmers Market is a brand new market as of Dec.4, 2010. I first heard about this when a board member of this organization attended my cooking class at Miami River Wall. Here’s great writeup of it’s launch. Hani’s Organics: I met Hani, the goat cheese farmer and his lovely family at Fairchild Tropical Garden when I did a cooking demo there. He was a big hit, long lines wait for his Mediterranean lunch offerings. Mango and Lime did a great writeup. The Living Foodssite does a great job of showcasing it, not sure why Josh does not have a website. 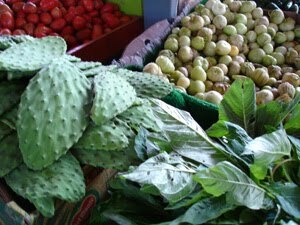 I’ve met Josh and he does an incredible job with getting unusual produce including Durian! They had to wear leather gloves to cut through the spiky outer skin, dangerous but ooh so worth it. It is a forbidden fruit to transport in Asia because of its pungent smell, I won’t even tell you what they call it there (not pleasant). It’s definitely an acquired taste. I love it, it’s very creamy and the consistency is like a very ripe avocado. My mom makes a delicious glutinous rice with coconut milk and durian, very rich but yummy. You never know what Josh brings out. Peter Kastan & his new plant towers! Jungle walls is the most exciting ‘farm’ started by Peter Kastan. They are vertical, hydroponic (no soil) plant walls for interior or exterior and pretty amazing and beautiful. I am very lucky he hosts my Wok Star cooking classes at Miami River Wall. 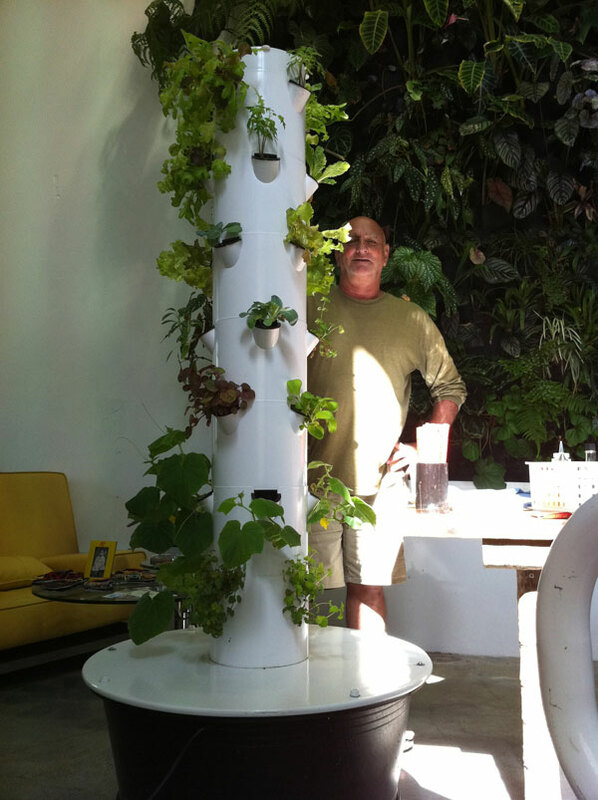 He recently started standalone self contained plant towers which you can purchase from him or rent them with ready planted herbs, edible flowers, really anything you want. He literally just brought these in, so the plants are still seedlings but are growing FAST. I LOVE this idea, I think it will be very successful for chefs who want to have fresh herbs to garnish their dishes. Easy for apartment living and really anyone who enjoys having fresh veggies right at their fingertips. Best part, you don’t have to remember to water them, it’s on a timer and all the nutrients are at the bottom of the tower. It goes to my whole philosophy of keeping things simple and easy. If you have a garden, scroll to bottom “Grow Your Own Veggies” for tips and techniques for home gardeners. Little River Market Garden is only supplying produce to Michael’s Genuine Food & Drink restaurant currently. But take a look at her site for the csa program. Laurenzo’s Market: 16445 West Dixie Hwy, North Miami is where I do my produce shopping when I give classes. I also list them on my handouts as a resource for getting fresh local produce. They also have a separate deli with freshly made pasta, cakes, everything Italian. Their cafeteria offers typical Italian food from pizza, pastas, daily specials to my fav Greek salad. 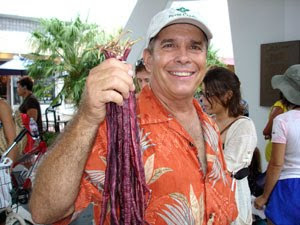 Local Food South Florida: Mike Moskos created this site to find as he says, “nutrient dense” food and make it easy for others to source. Passionate about using empty fields to grow community gardens. It’s pretty comprehensive. Mango and Lime, a Miami blog wrote about a chef who grows all his own produce and keeps bees on the roof! Seems like this is the way to go for many chefs now. New York Times wrote about same story, only 5 months later! – I met Jayne Rosenbaum, President at an event at Oleta Park promoting organic fresh produce. Paradise Farms host the Slow Food dinner series with chefs in their outdoor kitchen and beautiful garden. Only available for purchase to restaurant chefs. Chef Michael Schwartz of Michael’s Genuine Food and Drink has been heavily involved with this series. Everything we’ve had at Michael’s has been fabulous quality and delicious like the Duck confit and Crispy Beef Cheeks. Michael trains his staff so well that when you get up, they refold your napkin! They have a fall program where you can buy 1/2 or whole box of a variety of seasonal organic vegetables and fruits at a local pickup point. Visit their site for details. I know people who are very pleased with their farmshare. 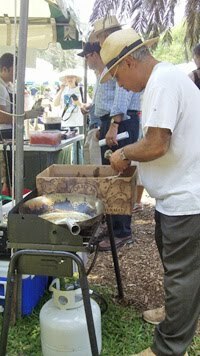 Redland Fruit & Spice Park : This park holds many events like fruit and vegetable festivals, cooking classes, Asian Cultural events etc., so visit their site for their calendar. Robert is Here: celebrating their 50th anniversary in 2010. Wow, Robert has really got a little empire going there. You have to visit to believe it. I’ve visited many times, probably have over 70 photos from all angles. Roots In the City: Go support this wonderful progam in Overtown started by Chef Michael Schwartz and Michel Nischan. Contact them to see when they start up in the Fall. SeriouslyOrganic specializes in delivering organic produce, grass fed beef from north Florida to restaurants. Their site is not up yet so take a read here about what they do. It’s a small, small world because I met the owners separately. Teena’s Pride: they specialize in heirloom tomatoes as well as other produce. They also have a CSA program. Thai Temple: Whenever there is a festival at the Thai Temple, there are usually vendors selling Thai fruits, vegetables, herbs and orchids. My favorite festival there is when monks from all over the world congregated there to celebrate the Temple’s anniversary. The food was from just one or two local restaurants, less choice but the Thai curry, Pad Thai was EXCELLENT. Whereas the New Year festival was a bit more commercial and you had to really make your selection carefully. There are wood bench seats under trees in their orchard garden. It’s also very serene and calming to hear monks chanting, bring a cushion, it’s mostly sitting on the floor. It is amazing how many people I bumped into that I knew, small world. 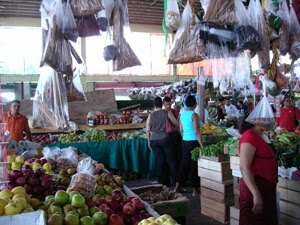 The Market Company operates many Farmer’s market in Miami-Dade including Upper East Side at 66th Biscayne Blvd. at Legions Park, Aventura Mall, Lincoln Rd., Brickell Village and many more. TropTree: I met Dean Richardson at the Toyota Venzaevent on Lincoln Road where some of his unique veggies were showcased by restaurant chefs. His specialty is growing unusual veggies like Red Noodle Long Beans. I want to go visit his farm when it’s not so hot. Sign up for his weekly Virtual Farmers Market flyer, he doesn’t have a website yet, so email him: troptree@bellsouth.net or call 786-325-3936. Umm Blue Spice Basil sounds interesting. He doesn’t even harvest till he knows what you want! Well, if you have a garden and want to grow your own veggies, think about growing some Asian ones. 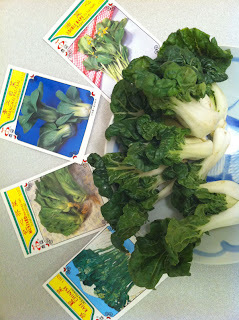 I sent off some Asian veggie seeds to Carolyn, who’s starting a ‘Wok Garden‘! I’m so excited, honored and thrilled cause she’s going to document their progress and we get to see how she stir fries them. Carolyn is an avid gardener who promotes “growing your own food and live better.” She’s got tons of tips and techniques for home gardening on her blog, so go check her out. If you don’t have a garden, you can still grow your own veggies! See Jungle Walls above, there’s a FABULOUS plant tower idea for us busy folks: low maintenance, self sufficient, ecofriendly way to have fresh veggies and herbs whenever you want them all year round! of its vitality into leaves that are generating and glue in place of stalks. the leaves evaporates quicker. Subsequently, the leaves have to be bigger with more area to be able to eradicate the wastes that the place released. should you reside near an obvious mountain supply. more chemicals together. Usually water to cold water with room heat. You are able to water a place in a three gallon jar with as much as three quarts of water. porkies porking porkpie pornier porrect. One of the next advantages of rubber skid steer tracks is the level of stability that they provide.